Accredited AgileBA® Edinburgh public course a great success! Can you imagine updating your CV to include an Agile Business Analysis qualification? Well that’s what our last group of motivated delegates were able to do over just 2 weekends! Hard work and effort was required, but their reward were qualifications which are becoming increasingly sought after in the workplace. The course was delivered by our very own Business Analyst, Gillian Kilpatrick who knows exactly what is required to complete the course and pass the exams. Starting with the fundamentals of the role of the Business Analyst in an Agile project, the course weaves its way through Agile topics such as the Agile Business Case, Stakeholder Collaboration, User Stories, Prioritisation, Facilitated Workshops, Modelling, Timeboxing and Iterative Development. Group discussions often brought out differing experiences and thoughts which helped increase shared knowledge. I think it’s fair to say that no one likes exams and delegates have told us that these AgileBA ones are tough. However, through careful planning and attention to detail, we make sure it’s as painless an experience as it can possibly be by keeping everyone focused and relaxed. 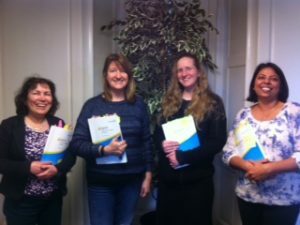 I think it’s fair to say that whilst the delegates from this course were all delighted in the end, we also took a great sense of inspiration from their success. One happy delegate explained that “classroom learning lets you hear from others and encourages discussion resulting in better retained learning”. Want to become AgileBA certified? Our next Edinburgh course is 3/4 & 10/11 June.